Sadly really, this piece doesn’t have the dateline “BUFFALO, N.Y.” leading it, but that’s the result of having other sports in full swing as the summer unfolds. Ever since the Florida Panthers’ brass decided to draft Jonathan Huberdeau five years ago, I’ve usually spent this week in the summer away from the oppressive South Florida heat and at the host site of the NHL Draft. For the just the second time since 2011, I won’t be at the draft as teams make deals on the floor of an arena and shape their future. I missed the draft two years ago in New Jersey – aka, The Barkov Draft – but that one was a real mess anyway, with too much back and forth from Newark to NYC. A bad experience other than snagging Barkov, of course – a brilliant move by Dale Tallon as the lure of Seth Jones and Jonathan Drouin hung in the Jersey air. The draft has been extremely rewarding to the Florida Panthers in the eight years I’ve been covering the team, but that’s usually what happens when your club is floundering. This year is similar to 2012, though, when the Cats actually drafted after the Chicago Blackhawks in Pittsburgh and selected Michael Matheson. I make the Chicago reference because I really had my eye on Teuvo Teravainen at that draft, and he’s been in the news lately. There are a lot of those moments, though, in the time I’ve covered the draft. I chatted with a friend as I rode the Light Rail in the Twin Cities, hoping Rocco Grimaldi would be available early in the second round after Florida chose Huberdeau the previous night. Grimaldi was there – the consensus was he was another first-rounder who just happened to be in the second round – and Tallon pounced when the 33rd selection came up. Yesterday, he was traded, ending the Rocco Era in Sunrise. Yeah, he was probably right. Vincent Trocheck has been better than good; he’s been outstanding. And Kyle Rau, chosen at No. 91 that day, has a great chance to do with this team what Grimaldi couldn’t. The same anticipation of watching these new prospects become a part of the organization and develop moved to Pittsburgh, where Matheson joined the fray. And from the Barkov Draft, second-round pick Ian McCoshen, who recently signed an ELC, could make an impression at rookie camp with bottom-pairing spots on the blue line up for grabs. Florida chose the big prize in 2014, getting love from Philadelphia in the form of star defenseman Aaron Ekblad. I stayed up late that Friday night wondering who Florida would choose with the second pick on the next day when Round 2 began. Buffalo had the first pick, and the anticipation of the second round is indescribable because clubs selecting early have those “fallers” like Grimaldi just sitting there waiting to hear their names called. Brendan Lemieux, goalie Thatcher Demko and Ivan Barbashev were the hot names, and I was keen on the latter, despite Tallon rarely selecting high-profile Russian players. I chatted with friends on Twitter about who to take, and most agreed on Barbashev but didn’t think Tallon would do it. The next day Tallon followed up on a promise he made to Jayce Hawryluk, taking him and leaving us in the media with a great interview. Like Demko, who was a media darling in the prospect interviews, Hawryluk was very open and immediately likable. He talked about his village of a hometown and the hotly contested pick-up games he played with his older brothers, aggravating matches that often left him frustrated but determined to win the next time. It was obvious to see that while this kid’s pest-like quality will likely lead to him being disliked by opposing teams and fans in the NHL, maybe to a Brad Marchand-like degree, Panthers jerseys sporting his name will be prominent at BB&T Center at some point. Especially if he keeps developing like he did these last few seasons in Brandon. In fact, when speaking of that anticipation that comes with prospects maturing, are there two more we’re eagerly awaiting to see make it than Hawryluk and last year’s first-round Lawson Crouse? As for tonight, I won’t fib and pretend I know too much about this draft. Like in Pittsburgh, there’s a tad less excitement when Florida picks this late; however, that’s the price of progress and success. But that old anticipation and anxiety will surface when the Cats’ selection comes up. If I had two longshots, I’d go with Val-d’Or power forward Julien Gauthier or Wisconsin Badgers center Luke Kunin, both dynamic offensive players but who likely won’t be around if the Panthers stay at No. 23. Either would be excellent additions. Since draft analysis usually deals in hyperbolic comparisons, Gauthier reminds some of Rick Nash while Kunin is a Dylan Larkin clone. Russian-born Vitali Abramov, also a right winger like the American DeBrincat, is super skillful and dazzling at times, but it’s hard to pass on a player like DeBrincat, who has produced consecutive 50-goal seasons. The 5-foot-7 winger has scored 102 goals in his last two seasons. USA Today hockey writer Kevin Allen said he “might be the niftiest goal scorer in the draft.” He’s feisty, tenacious and a good skater, and oddly, most don’t mention his size as a liability. He outskates and outworks much bigger players, and he just scores and scores and scores. Did I mention those back-to-back 50-goal seasons? That would have me anticipating even more – despite not being in Buffalo. As stunning as the news was last Tuesday that Rocco Grimaldi was being called up from San Antonio so he could help out in Los Angeles, the word Sunday that he had been sent back down was, well, non-stunning. After sparking a rally in Nashville that helped the Panthers shock the Music City faithful and had them staying a little later at Bridgestone Arena than expected, the Cats decided to ship Grimaldi back to the AHL. First, understanding the connection with Grimaldi is necessary. The first NHL Draft that I covered was the 2011 one in St. Paul, a weekend that produced Calder Trophy-winning rookie Jonathan Huberdeau, Grimaldi in a second-day shocker, Vincent Trocheck and other exciting prospects like Kyle Rau, Jonathan Racine, Yaroslav Kosov and Logan Shaw. Being drawn to and liking the 5-foot-6 Grimaldi, a polite, forthright, devout son of parents in law enforcement, proved to be as easy as Florida GM Dale Tallon picking the California native with the 33rd selection overall. Grimaldi was cordial in speaking with the media, had a plan of playing in college at North Dakota and expected to be with the Panthers after that. The one word I left Minnesota with to describe Grimaldi after talking to him was “determined,” which probably has plenty to do with his upbringing, skill level and competitive spirit, perhaps due to his physical stature. Fans loved him and lined up to meet the 21-year-old forward in camp. His play in the preseason on a line with close friend Trocheck (read about their friendship) and Quinton Howden had fans loving him even more. His play in seven NHL games so far has only fortified Cats fans’ opinions, and their ire at him being sent down again is justified. But there’s just no room on this roster. The injured forwards who traveled with the Panthers on their recent 2-1-1 road swing against Western Conference playoff teams are getting healthy. Sean Bergenheim, Brandon Pirri and Dave Bolland all skated and appear close to returning. Bolland has been day-to-day since being injured in the season’s fourth game – Gerard Gallant’s first win – on Oct. 17 in Buffalo. 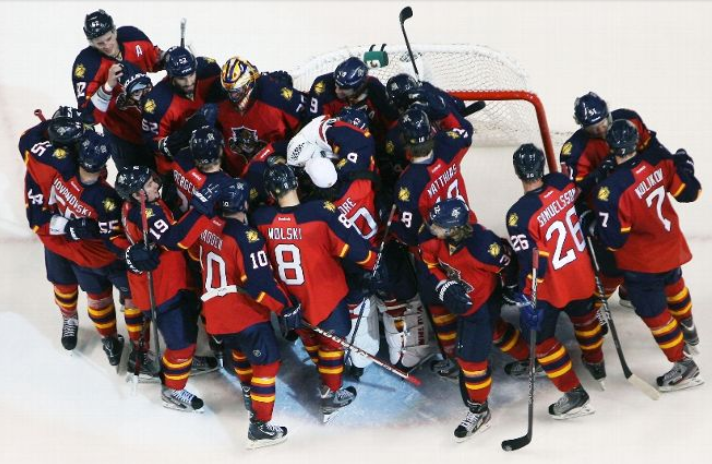 Florida was 1-2-1 after that Roberto Luongo 1-0 shutout; they’re now 7-5-6. That’s how long Bolland has been out. Bergenheim needs to be in, too. He scored the only goal in that Buffalo win, and when healthy – a big assumption – he’s productive. Same with Pirri, who Heimlich Maneuvered the club when the offense was gagging on early-season fumbling and bumbling. The healthy ones are making their cases as well. Tomas Kopecky contributes a ton, while Tomas Fleischmann played his best hockey at the end of the road trip. Scottie Upshall, who missed the last two games, is an emotional player who leaves it all on the ice, often with good results. It’s a forward-filled roster that’s bursting at the seams. It’s like a fat man after a cheap lunch-time buffet: swelled, plump, and with few options. Grimaldi will be back at some point this season. Injuries open up spots all the time, and his talents are undeniable. He’s fast, relentless and low to the ice (naturally). And on a team that’s pass-happy, he’s generally a shoot-first guy. His bond with Trocheck is tight, too, and the duo should be paired up in Florida red sweaters for years to come. Plus, if you’re really upset that he was reassigned to the Lone Star State, find solace in that he’s still in the organization; he possesses the kind of talent that could easily have been the centerpiece in some offseason trade, though there was no talk one was in the works. But this Florida Panthers’ roster? It is what it is. When the thought of women’s Olympic hockey came up early Wednesday morning, I jumped at the opportunity. No hockey for a long time is really bad for the soul, and the chance to get a good taste of a heated rivalry like the USA against rival Canada was enticing. There’s pure, unadulterated hatred between the two clubs. As an American, I was, of course, dismayed by the outcome. I thought the USA moved the puck around and possessed it better in the first period, but it took three outstanding saves by netminder Jessie Vetter to keep the game scoreless after one period. After trailing 1-0, feisty Team Canada played a stronger game and took advantage of a controversial second goal by Hayley Wickenheiser to pull ahead 2-1. Once the Canadians stretched it to 3-1, Team USA scored one and had a two-man advantage inside the last minute after Canada committed a minor for too many (wo)men on the ice, but the Yanks simply ran out of town. It was a great win for Team Canada, and it was just Round 1. There’s a good chance these two clubs, who truly dislike one another, meet in the medal round, perhaps playing for gold. If that happens, I’d like the USA’s speed to outlast Canada’s tough physical play and come away the winner in the rematch. HELLO, OLD FRIEND – It was nice to see Kevin Dineen pop up again on my TV. I always found Dineen to be a personable chap during his tenure behind the Florida Panthers’ bench, and it’s great to see him have some success – even at the expense of Team USA. Dineen had to have been shocked to be on the winning side of Wickenheiser’s controversial/reviewable goal because he lost about 95 percent of those with Florida. That’s the good for Dineen. On the negative side, well, let’s just say we saw those too many men on the ice infractions way too often with Dineen as the Cats’ coach. GREAT GAME, GREAT TIME – Watching the game reminded me of the World Junior Championships two years ago when Vincent Trochek and Rocco Grimaldi paced Team USA in the gold medal game over Sweden in the wee hours of the morning over here stateside. I can remember getting up at 3:59 a.m. for those 4:00 ET starts, making a pot of coffee and cheering on Vinnie and Rocco, who sounded like a pair of mobsters, with the house all to myself. Nothing quite like getting up way too early and enjoying some java and puck. It’s the same thing I do with the British Open golf tournament – just without the hockey. GIRLS ROCK – If you haven’t been exposed to the women’s game, you’ll be surprised: These girls can play. Team USA is incredibly fast, and the skill level is quite high. Plus, they communicate well. In fact, certain NHL teams could learn to stay onside like these women who fly up and down the ice with their ponytails swishing around because they always seem to be on the same page, again communicating and playing well with one another, not making many mental errors or silly passes. I don’t like the players being referred to as “ladies.” We don’t call the male members of the NHL “gentlemen” — ever. Maybe at the Lady Byng Trophy presentation, that’s about it. And I doubt all the things heard on the ice in Sochi would qualify as lady-like. But that’s a minor gripe. When the NHL was locked out in the fall of 2012, I expanded my DirecTV package to include more sports in an effort to see more college hockey, especially the University of Minnesota for Nick Bjugstad and Kyle Rau, and North Dakota to watch Grimaldi play. What I didn’t get to see then or didn’t notice at the time was any of the women’s game. That’s a shame – again — because these girls can play and it’s a fine quality of hockey.